I looooooved Lip Lickers from Village Bath (in Minnetonka, wooo, Minnesota represent!). 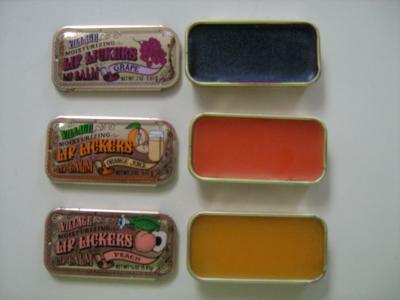 Lip Smackers were awesome too of course, but they're still around and never really went away. Lip Lickers, on the other hand, are a special memory that not everyone has. They came in those cool tins with sliding tops and were decorated with vintagey graphics of flowers and fruit. Some had two flavors per tin -- remember those? You slid the lid one way for one flavor and the other for the second. YES, I remember these! I loved the strawberry. Had tons of Village goodies--bath salts, bubble bath, I think I had a body splash, too. And the Lip Lickers, of course. Village products were my favorite teenage pampering choice. I had no idea those were a Minnesota thing! That is so cool. I haven't thought about those in an age! I had two of the two-flavored ones -- Strawberry/Cream and Watermelon(?)/Ice. Unfortunately, the idea of an ice-flavored lip gloss turned out to be better than the actual reality.